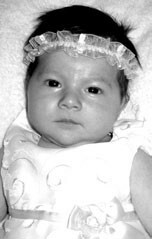 BLAIR ELISE LECROY, daughter of Charles and Jamie LeCroy of Armstead, was born May 6, 2009, at St. Vincent’s East. She weighed 7 lbs. 1 oz. and was 20 inches long. She is the granddaughter of Charles R. LeCroy, Pine Mountain; Karrie Goodson, Snead; James Stephenson, Hayden; and Patty Stephenson, Oneonta. Great-grandparents are Mary LeCroy and the late James A. LeCroy, Pine Mountain; David W. Roehrig, Mesa, Ariz.; the late Cordelia Mae Clark, San Carlos, Ariz.; and Wylodene Stephenson and the late Ethridge Stephenson, the late Ross Henry, David and Barbara Lowe, all of Armstead.